My box of scraps was full and the overflow looked like a pyramid! 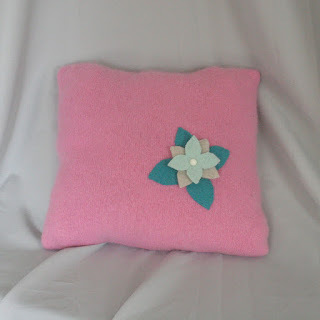 It was time to make a pillow. I chose a wool/angora/nylon blend (recycled sweater), so it's really soft and cushy. It's stuffed with woolly scraps, and feels nicely solid. Even the flower is made from scraps, and the button is from an old sweater. Once, twice, three times recycled.